The Electronic music synthesizer is a somewhat heartless collection of solid-state circuits controlled from an all-to imposing looking panel of knobs and switches. The design and function of these circuits are controlled by the strict laws of physics, but when the endless varieties and combinations of sound the synthesizer can produce are explored by a musician,the result can be a beautiful music new to one’s ears. 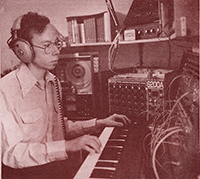 Although the variety of sounds that the synthesizer can produce is vast, it make a poor musical instrument, because the control of tone, color, articulation, and loudness that are possible on the simplest acoustic instrument is clumsy, if not impossible, on the most advanced synthesizer. The synthesist overcomes this limitation in three ways: other machines can be used to control the synthesizer, devices that can change settings faster and more accurately than human hands. Second, with the resources of the modern recording studio, sounds can be changed once they are recorded, and many sounds can be “layered” on tape to give the fullness of many instruments played at once. Finally,acoustic instruments can be played to electronic accompaniment, taking advantage of the capabilities of each. All of these methods require careful preparation and this, along with the experimental improvisatory nature of the music, makes live performance of electronic music difficult. This leads to an exciting thought: although recordings of every other kind of music are imitations of real performances, a recording of an electronic composition is a true performance. When such a performance is heard on a record or on the radio, it is the composer performing in your home! electronic music that has been vaguely described as “commercial” and “popular,” both words conjuring false preconceptions of the way this fine music sounds. But that brings us back to the problem of defining the music of the new electronic music composers, and the best way I can communicate the essence of their music is to play it for you.